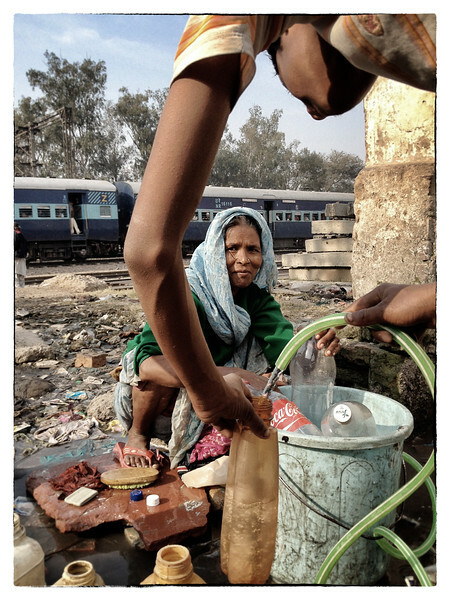 A woman washes clothes at a water tap - connection made illegally to the municipal water line in the outskirts of Kathputli colony, a slum in Delhi known for its artisans and puppeteers from Rajasthan. Access to water in the colony is limited to siphoning water off the community taps. Real estate developer - Raheja builders schedule to rehabilitate the slum by building a multi level apartments for its residents along with commercial and residential apartment complexes.